Interested in having Pamela judge your show? Pamela has been quilting for more than 20 years. As a wife and mother of 5, quilting afforded her an outlet for her creativity and a mode of relaxation. Her specialty is scrap quilts. As a former reenactor, she also has a special interest in Civil War Era Reproduction Quilts. She is proud to be a Veteran of the US Navy as well as a Navy Wife and Army Mom. 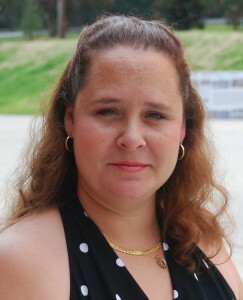 She lives in Chesapeake, VA with her DH (darling husband) and 3 of their 5 children. "do it your way" and "try something new". She believes in using ever piece possible. "A judge should recognize accomplishment and encourage growth so that quilters desire to reach for new heights in the craft." A quilt judge has a responsibility . . .
- to be familiar with as many styles of quilting and textile art as possible. I don’t expect to be an expert at them all, but at least have the knowledge to recognize and evaluate the technique. I study historical information and try new techniques so that I am better able to evaluate them. Having tried the technique helps me to understand the skill level needed and the process the quilter went through to achieve the desired effect. - to be informed on current events and trends in the industry. I stay current through membership in local and national quilting organizations and by reviewing many quilting magazines, blogs, and web sites. - to be impartial. We all have favorite styles or quilt patterns but once the judging hat goes on the preferences are put away in their happy place. Each quilt is judged based on its own design and workmanship. - to encourage quilters to continue their quilting journey and grow in their craft. My role as a judge is to give an honest evaluation of the quilts before me and to give comments that are useful to the quilter. In my comments, I try to recognize at least one thing the quilter did well and one thing that could be improved.